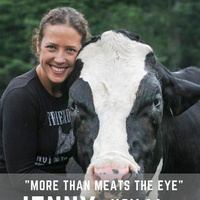 Louisville native Jenny Brown, founder of the Woodstock Farm Sanctuary in NY and author of the book The Lucky Ones: My Passionate Fight for Farm Animals, speaks on the ethics of using animals in contemporary industrial agriculture. Addressing impacts on both animals and the broader environment, Brown argues against eating animals and for liberating them from stockyards and feedlots. Aimed at students. Open to the public.